IT-OK Limited is a young dynamic company based in Cornwall that provides a total IT Solution for small businesses throughout the UK. The company was founded by Ian Chambers in recognition that small businesses with little internal IT resources struggle to find a one stop solution for support, management and integration of the key IT services. Ian Chambers, a family friend, had already discussed changing Joe’s blog to a website months before he died so the moment we decided to tell Joe’s story after the funeral so we went to work and delivered the site a week later, a real achievement. 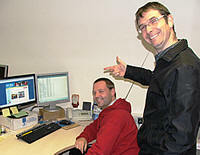 Matt and Ian meet every two weeks to update the website. With so many events happening and fund raising which is running at over £1000 per week it normally takes up to four hours to complete, and that is with everything prepared before hand. Richard from IT-OK has worked on the website adding many extras including the blog and gallery which Matt can log onto and change at any time. Ian, founder of IT-OK said “to be able to help has been great, the funeral was very moving and I went away wanting to do something, when the challenge of getting the website up and running within a week was given we went for it”. Matt Way said “the website has kept me sane and given us a positive way to channel all the mixed emotions you have when you lose a child”. P&J Print of Newquay has produced over 2500 various posters for events and invitations as well as business cards and other media support. Jamie Elliot said “as a company we got involved because Joe touched our hearts and we felt that raising funds for a children’s hospice in Cornwall is a brilliant idea. We can’t always support financially but having a printing company opens up doors in other ways of support. The business was started 23 years ago in two garages and has grown to where we are today. We produce anything from black and white photocopy to full colour brochures”. For more information visit their website at www.pjprint.co.uk. 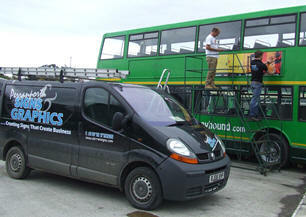 Perranporth Signs & Graphics are a high quality bespoke sign maker and design company based in Perranporth, Cornwall. Our manufacturing facility produces signs of superior quality and our skilled team of installers travel all over the South West. From the full events package at the 2010 paddle, stickers, banners and the mighty Paddle bus these guys have been great with bringing the branding to a new level. Owner Mark Hutchinson, Davey and Laurie pictured with Matt getting the bus ready have been a great support with getting Joe’s message out there. 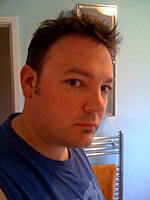 Scott Dickinson has designed all the various posters, stickers, logos and other media for the joeway.co.uk site and fundraising events. Scott works with Matt and are family friends. Scott said “I was asked if I would help with the promotion of the Joe Way fundraising website and things have escalated from there. Being a friend of the family I have been designing their promotional items since the start of the campaign, from the original logo concept to the surf board and car sticker design, huge pull down banners and event posters. It’s good to do my bit to build a much needed children’s hospice in Cornwall”. Dean Woods worked with Joe’s Dad for 10 years at Hendra Holiday Park and knew Joe very well although he has moved to another Holiday Park his support for Joe’s story has continued. Dean has fronted many fundraising events, Corporate functions as well as taking Joe’s message to The Royal Cornwall show which he has compared for the last couple of years. World champion longboarder Ben "SKINDOG" Skinner has supported Joe's Appeal from the first group photo of surfers when the website was launched in 2008 to the present day. Ben has made and gifted two Paddle for life longboards that have been ridden by Matt Way (Joe's Dad) and has held fundraising events at his surf competitions, surf camps and donated time and prizes. Tom said “My main aims and goals I am setting myself for 2010. Firstly to improve my UK Pro Surf Tour ranking finishing 2nd last year I only have one way to go being crowned the champ at the end of this season”. “Secondly we have some of the best big wave spot's in the world here in the Great British Isles, I want to get some great shots of the banner and help get Joe’s story out there as well as fundraising. Matt Way Joe’s Dad has been endlessly putting together content for the web team and press releases sometimes sending four a week out trying to keep up with the people inspired by his son's short but action packed life. The media coverage has been huge with local TV, radio and newspapers, as well as national coverage with everything from surfboard stickers, car stickers, huge banners, DVD's, bags for life, crazy stunts, fashion shows, auctions, beach raffles, teaming up with organisations, businesses, green ideas, TV personalities, family, friends and complete strangers have played a part on this incredible journey.